A well-fitted saree totally depends on an ideal blouse designs. Saree is not only garments, in India its tradition. India has 29 states and throughout the country saree is one of the most popular outfits. It is worn differently in every state but the six-yard elegance is still the most beautiful in every sense. Lot of us may have seen generations of women wearing sarees in different styles. Saree has been one of popular outfit which we can say India has developed and nurtured like a child. Khadi, Banarasi, silk these are few names of the types of saree available in India. It is our culture and diversity that we hold on to this particular trend as our national heritage. When we are talking about saree we can’t miss designer blouses. Blouses have their own aura and zest without these a saree had no meaning and it doesn’t look complete. There are more than 100 blouse designs which can help your saree to look gorgeous. Getting ready for a formal event and still confused about what type of outfit you want to wear. Guess what? Now you can even wear a saree, I know that you are still not satisfied because for a formal event saree am I serious? Yes, I am! You can easily wear a saree with a collared blouse in aesthetic design and colour. 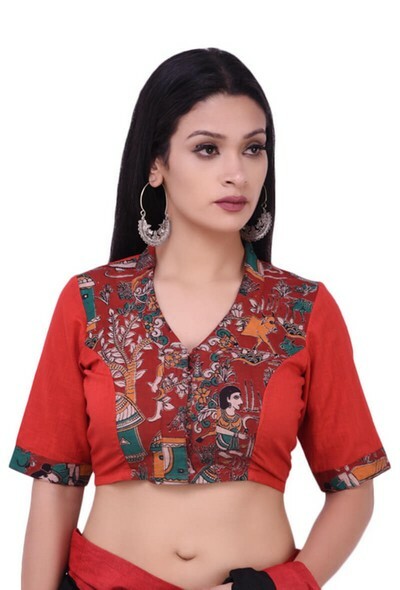 This blouse here is adorned with comprehensive Kalamkari designs along the front, this pure cotton blouse is a must-have in your wardrobe. Taking over the all the trends is this flared sleeves blouse, this is the most stylish and amazing trend one can pick for any party or gala night. Tailored to perfection in a contemporary pattern, this cotton blouse showcases a persona of modern contemporary style. This has alluring bagru print which can be paired up with any solid colour saree or a saree with borders. A classic blouse design which has been one of the favourite of all time, this can be paired up with any saree printed or solid. Now talking about the above blouse, this is handcrafted in chambray. 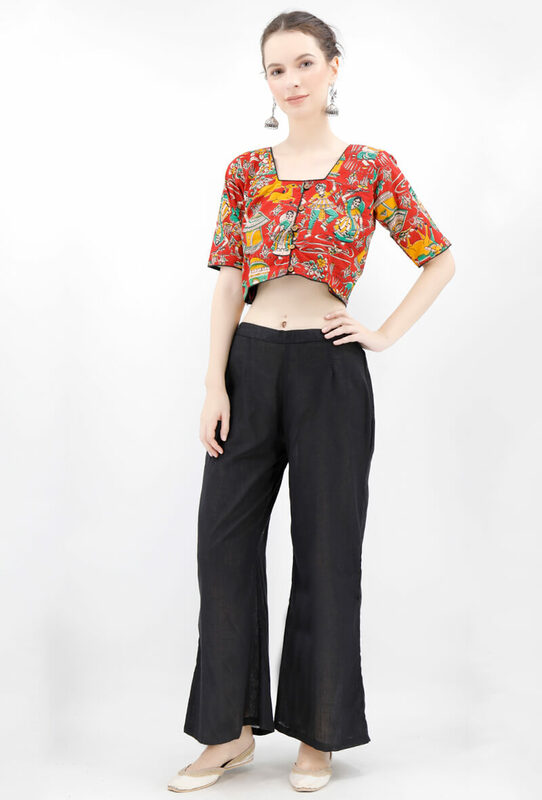 It is a multi-use blouse; it can be used as a crop top with jeans and high waisted jegging. 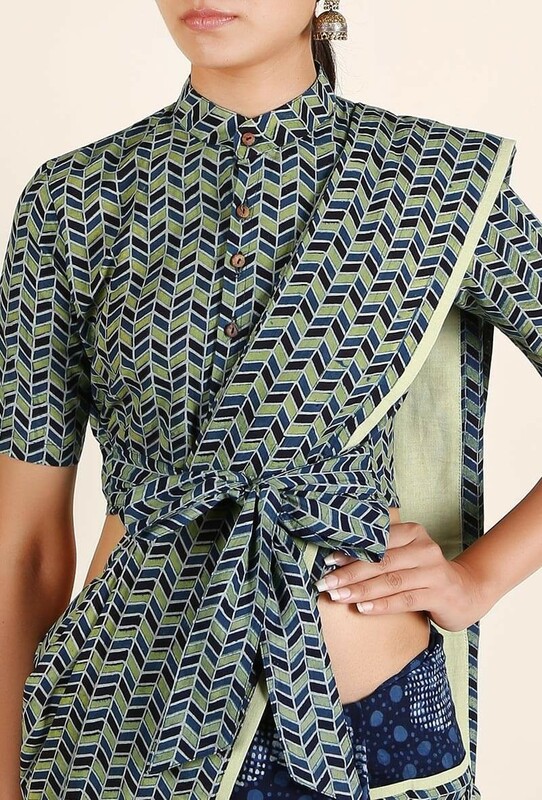 Add a hint of modern-ethnic flair to your festive look with this cotton blouse adorn with a contemporary front self-tie bow. Handcrafted with finesse and decorated with all over Ajrakh print. You can pair this with any saree which complements the colour and design. Accessorize it slightly with tribal jewellery to look amazing. If you are looking for your daily wear blouses then I would suggest you go for round neck blouse which is simple yet classy. You can easily get readymade blouses at any online platforms. There are so many options for round neck styled blouses. If you want to style it up then wear dainty jewellery to draw the attention. Square neck designs are best for those who have a narrow bust frame and lean body. This is the simplest of its kind and is available in various back and front designs. Even you can get Dori at the back and flaunt your subtle back. Pair this up with subtle saree and dainty jewellery for a simple and casual look. High neck blouse designs are the one of the best in the blouse design as it can be used for the formal event. It has various designs like embroidered and plain patterns. It can be paired up with any plain saree or a saree with a designer border. This is one of those blouses which you need to rock the party. The pear design in the front makes it look glamorous and spark up the whole look instantly. With halter neck blouses you will never feel short of style. They will make sure that every saree looks extremely alluring to you. Off shoulder, blouses are the most exquisite pieces to flaunt. Its appeal is sensuous and elegant, it can be found in many designs embroidered and plain with mirror work or with subtle border. Most of the Bollywood celebrities are in awe of this style and can be seen wearing these at most of the events. This can be paired up with a pretty choker necklace as it has a board neck design. Pairing up this with a light hued saree will make you look exemplary. 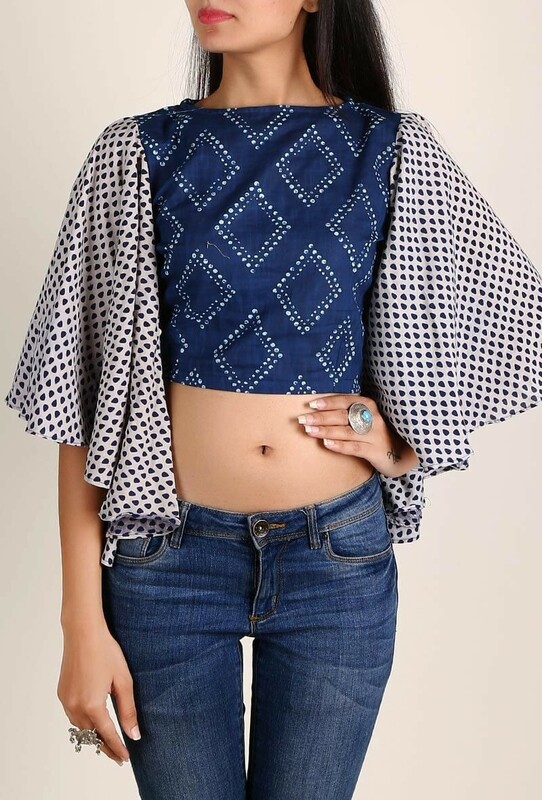 This Border blouse design is a perfect combination of style and elegance. It is best suited for those who want to experiment with sleeves and also who don’t want to flaunt their arms. Sheer full sleeves blouse is a must try and a must-have in your wardrobe. They are the trending in the marathon of fashion and style. They can be paired up with a net saree or with an embroidery design work saree to make a jaw-dropping combination. This stunning piece of art is established to make people go gaga! This is the best design in the list of trends, nothing can beat this style. This can be easily paired up with any plain saree because the blouse itself is so gorgeous that you don’t need much to do. This is the latest blouse design in the fashion trends. There are several blouses back side designs which are specially curated to draw the attention at the back. Since we are talking about the back designs there are several different types of back designs which can make your look more alluring and beautiful. These designer blouses are one of the most trending blouses available in many fabrics and designs. The backs of these blouses are mostly supported with thin threads called Dori. This can be paired up with any georgette, chiffon, silk sarees etc. Accessorize it like never before with some of the great stylish pieces of jewellery. There are two words that describe this blouse type are sensuous and elegant. They are so simple to put on and as you put this on these add an unparallel look to your whole appeal. Best for the parties and gala nights, you can easily pair up this with sarees like chiffon, chanderi, tender silk, georgette and many other fabric will perfectly complement this type of blouse. Sheer blouse or any other dress put an ultimate charm to any women personality. Isn’t it amazing? The back story works wonders with a light embroidered saree. Sheer back with light embroidery design and subtle placement at the bust area is a must-have in a sheer blouse. The blouse designs back side is a must to see before making any purchases. 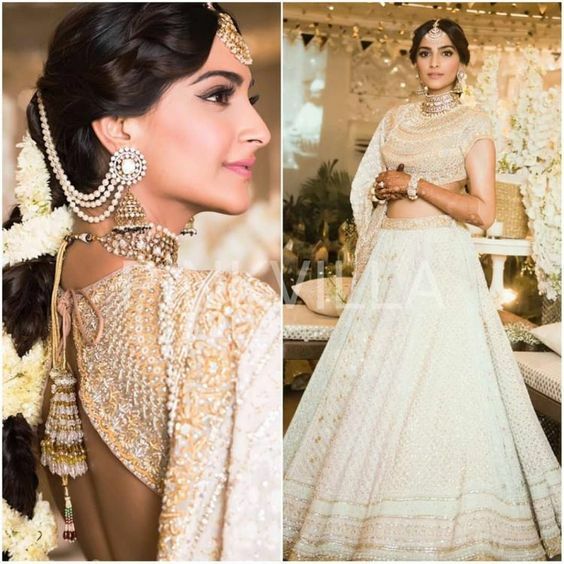 How gorgeous Sonam looks in this blouse and lehenga. Isn’t she alluring? This blouse is a lovely addition to the blouse brigade. This Bridal blouse design is the new addition to the collection. It can be worn as Sonam did or with a saree as well. Some of the fabric which will complement this blouse is chiffon and georgette etc. What we look for in a blouse is a very important thing. If you see here Karishma Kapoor is slaying with a single hook blouse. The backless portion of the blouse is extremely exemplary and delicate. It can be used for event nights and functions where you want to look dead drop gorgeous! 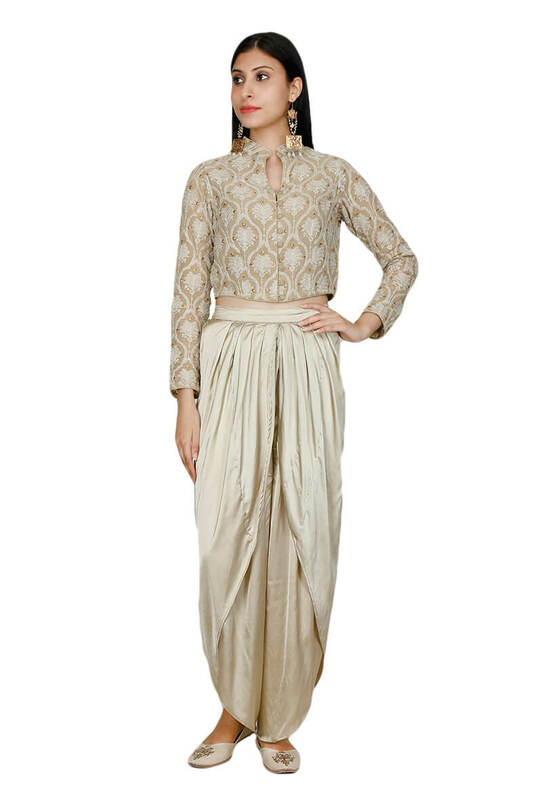 You can easily pair this up with a sheer saree with slight work and light colour hues. To complement further add light pearl jewellery. Don’t forget to wear heels or juttis if you are not comfortable in a saree. This blouse showcases the elegant jeweled design and embellished sequins work. If you look closely, this blouse pattern showcases the delicate artistry to be teamed with floral saree or any sheer saree. This is also a single hook design. Pair this up with semi-sheer sarees, fabric like Chiffon, Georgette, Chanderi will complement this in the most amazing way. The back flap has to be heavy in weight so that it can easily stay at its place. If you are giving this for stitching then look for the side hemlines which has to be perfect in any sense. Make sure that to add a slight amount of jewellery in your look. The latest blouse design is this sheer yet beaded pattern at the back of the blouse. This makes any saree look more alluring as you can see the work done over here is tremendously gorgeous and also has secured you from adding anything else to the look. This can easily be paired up with dark or light hue sarees and with statement earrings to make look complete. To make sure the back side blouse design is visible try to secure your tresses in a bun. 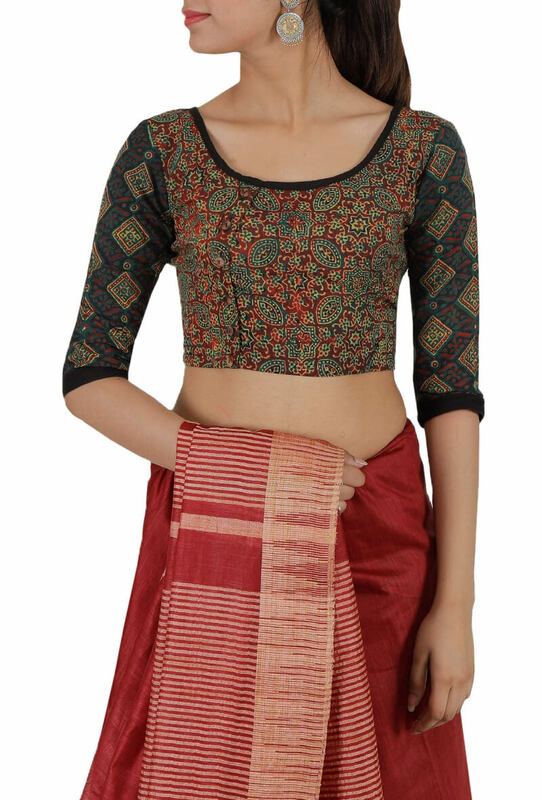 This pretty cute style of blouse will look amazing on girls who are trying to wear saree for the first or second time or anyone can wear it. This has a cute bow at the end of the blouse which will make the saree or lehenga amazing. Any colour or hues will work in this but preferably choose a dark colour to make your bow look visible. Make sure that your blouse fitting is perfect. Pair it with embellished sarees for a perfect look. Flaunting a stylish and sweet design of heart at the back of the blouse is a must-have in your wardrobe. This is truly amazing design, it can be paired up with any saree which have a bold border on the edges. To complete the desired look, tie your hair in a bun and accessorize it with flowers. Wear statement earrings or danglers to enhance the look. One side drop blouse designs is one of the most stylish designs ever made. 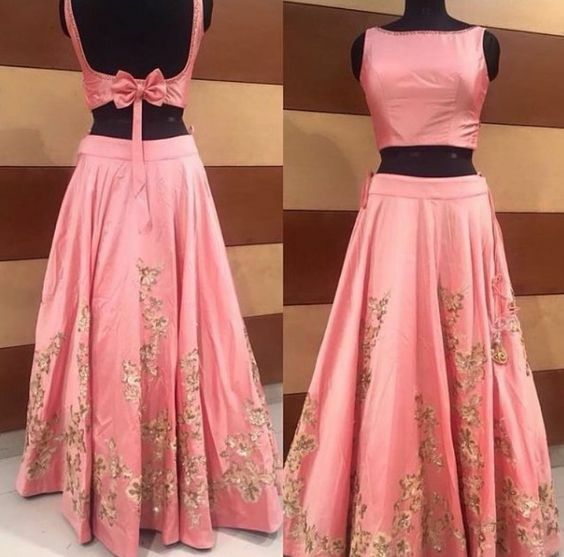 It is not easy to carry but if you want to wear this then you can easily pair this up with a satin, silk saree and wear statement earrings to complete the look and stand out of the crowd instantly. So, here we have a complete the list of blouses with front and back designs. You can now easily choose and try new designs for any event or functions. Make sure to let us know your experience and don’t forget to accessorize with any type of blouse designs. We hope this blog was helpful to you. 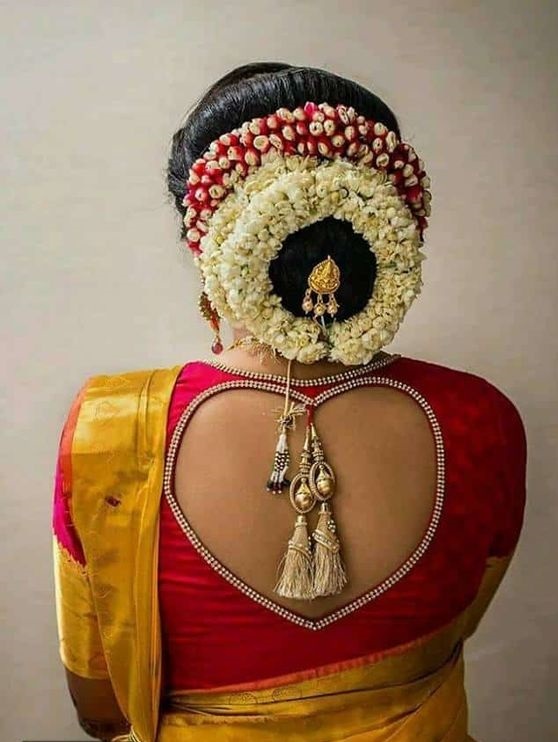 Drape your saree in a conventional manner for example if you wearing a blouse with from design then don’t wear the saree in a manner that it covers the entire design and the same goes to the back side. If you are wearing a backless or a tie down type of blouse, then make sure you choose a hairstyle which reflects your back and the designs of the blouse instantly. Happy shopping and stay stylish always!